Jean Cocteau was an enormously prominent French artist and author widely recognized as one of the major figures of Dada and Surrealism, two key early avant-garde artistic movements. With a portfolio that spanned painting, novels, poetry, plays and films, Cocteau established himself as a leading creative force in Paris. He maintained long-term friendships with artists such as Pablo Picasso, Tristan Tzara, Francis Picabia and Man Ray. 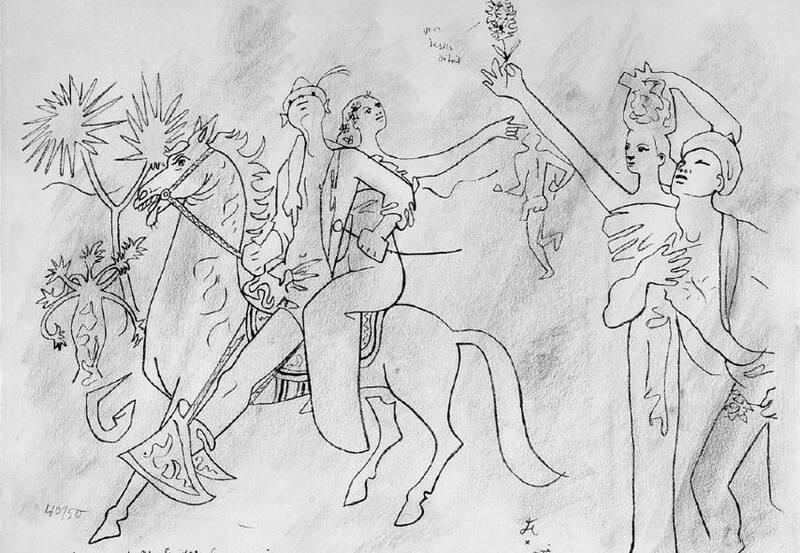 The self-taught Cocteau would regularly draw his friends and acquaintances in a distinctive, fluid style informed by his interests in Cubism, psychoanalysis and Catholicism, all three fused with the conceptual foundation of the aforementioned Dada and Surrealism. 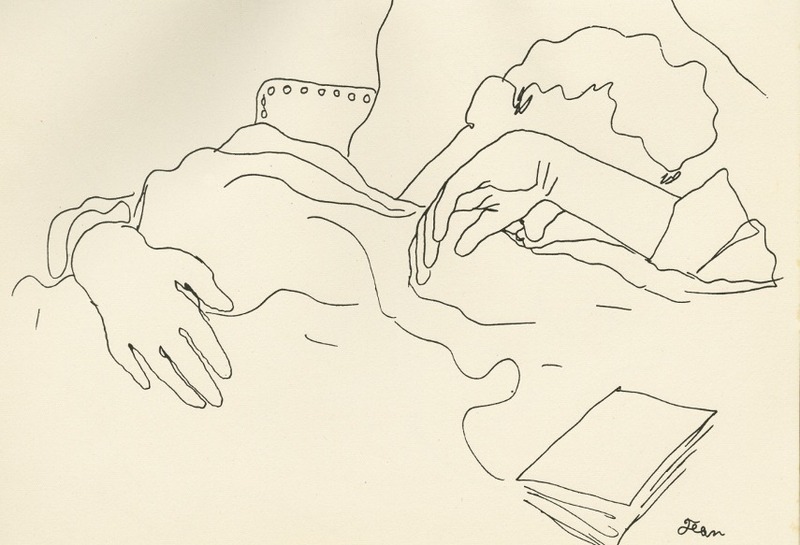 Although he worked across a wide range of media, Cocteau seemed to treat all of his techniques similarly, often observing every method as an adapted variant of writing. Jean Cocteau was born in Maisons-Laffitte, Yvelines, a town near Paris, to Georges Cocteau and his wife, Eugénie Lecomte, becoming a part of a socially prominent Parisian family. His father was a lawyer and amateur painter who, unfortunately, committed suicide when Cocteau was nine. From 1900 to 1904, Cocteau attended the Lycée Condorcet where he met and began a relationship with schoolmate Pierre Dargelos, a man who would later reappear throughout Cocteau’s oeuvre. Jean left home at fifteen in order to chase his dreams of becoming a poet. He published his first volume of poems, Aladdin’s Lamp, at the age of nineteen. Cocteau soon became known in Bohemian artistic circles of Paris as The Frivolous Prince, the title of a volume he published at twenty-two. 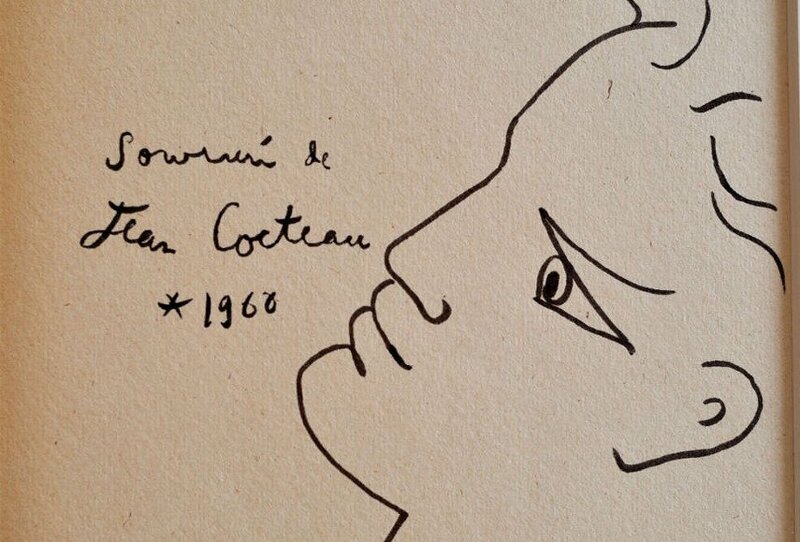 In his early twenties, Cocteau became associated with the writers Marcel Proust, André Gide and Maurice Barrès. However, as the case was with many young artists of the time, Jean’s development was violently interrupted by the World War I – he served in the Red Cross as an ambulance driver. Something good came out of the whole dire event, however, as Jean met the poet Guillaume Apollinaire while in war. 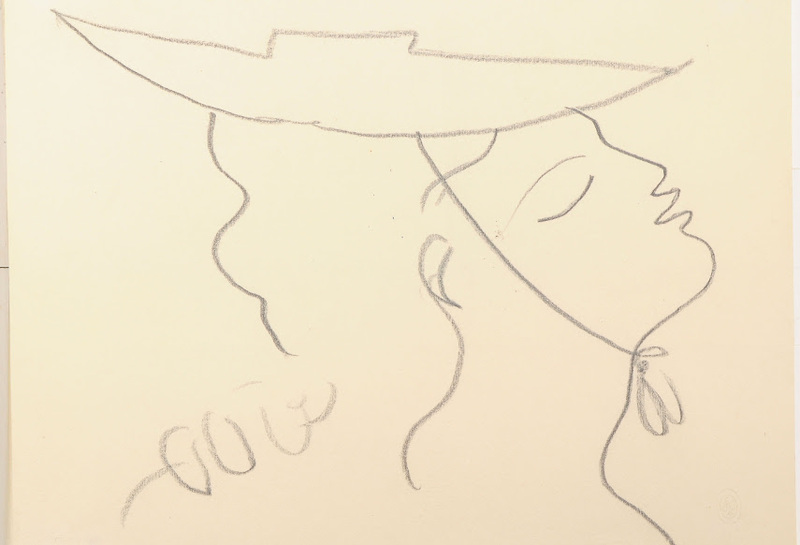 Apollinaire later introduced Cocteau to the likes of Pablo Picasso and Amedeo Modigliani, as well as with numerous other writers with whom he later collaborated. Jean soon formed friendships with many prominent members of the Parisian avant-garde and became a vital part of the entire scene. Although he never wanted to fully commit to one movement, he was regularly linked to Dadaism and Surrealism. Furthermore, Cocteau had great influence on the work of others as his opinion was held in an extremely high regard by his contemporaries. In 1940, Le Bel Indifférent, Cocteau’s play written for and starring Édith Piaf, was enormously successful. Jean also worked with Pablo Picasso on several projects and was a part of various events from the world of art The City of Light was well known for. 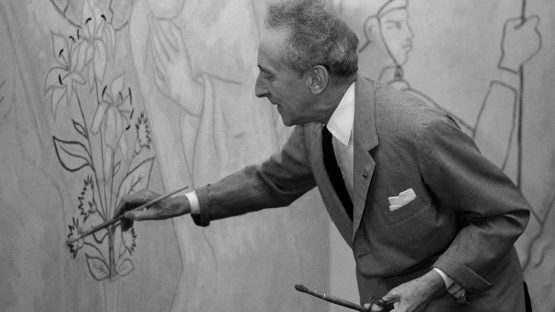 Despite the fact he never publicly declared himself a part of any movement, Cocteau was viewed by many to be instrumental in numerous avant-garde currents present in France and in the neighboring countries. Some controversies surrounded Jean’s name, however, most primarily the fact he was openly right-leaning when it came to politics. Cocteau’s friend Arno Breker convinced him that Adolf Hitler was a pacifist and a patron of the arts with France’s best interests in mind. His opinions changed rapidly when World War II began, a time Jean Cocteau spent by constantly getting in contact with his friends in high places in order to save his colleagues and acquaintances, most namely Max Jacob. After the biggest war event of human kind came to a halt, Jean returned to making art. However, he was much more concerned with writing at this point. He was also fascinated with the rapidly developing medium at the time – films. Cocteau’s films, most of which he both wrote and directed, were particularly important in introducing the avant-garde into French cinema and influenced to a certain degree the upcoming French New Wave genre. The films The Blood of a Poet (1930), Beauty and the Beast (1946), Les Parents terribles (1948), and Orpheus (1949) are among his most recognized works. His final film, Le Testament d’Orphée (1960), featured appearances by Picasso and matador Luis Miguel Dominguín, along with Yul Brynner, who also helped finance the film. Cocteau died of a heart attack at his chateau in Milly-la-Forêt, Essonne, France, on the 11th of October in the year of 1963, at the age of 74. His close friend, French singer Édith Piaf, died the day before and it has often been said that Jean’s heart failed upon hearing of what happened to Piaf. 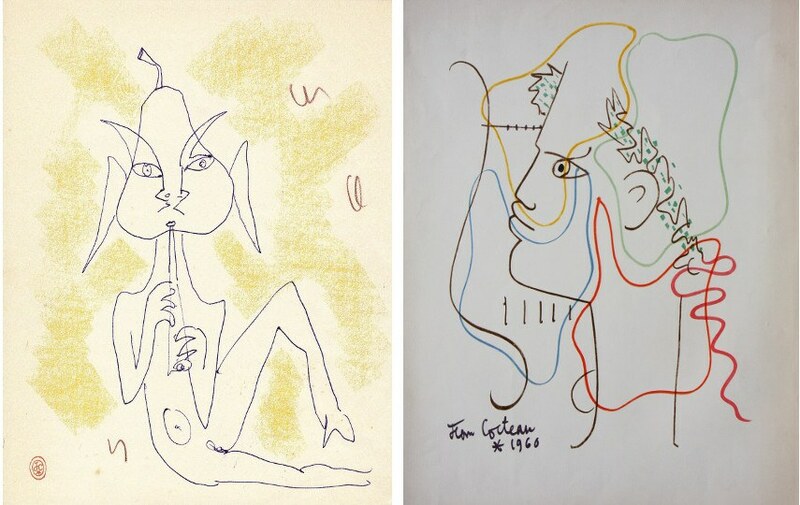 Upon hearing of Cocteau’s death, the French art scene was left stunned as it just lost one of the nation’s most important and pivotal artists who laid down the foundation of what we now call modern and contemporary art. We see fit to finish this short overview of Jean Cocteau’s life with the immortal words of the artist himself who attempted to define the duty of a poet and an artist: The job of the poet, a job which can’t be learned, consists of placing those objects of the visible world which have become invisible due to the glue of habit, in an unusual position which strikes the soul and gives them a tragic force.